Two of the most distinguished and influential Roman Republic writers were Cicero and Catullus, one a wealthy lawyer, political theorist and powerful orator; the other a socially prominent poet. Although they wrote at the same time, they are not often thought about together. 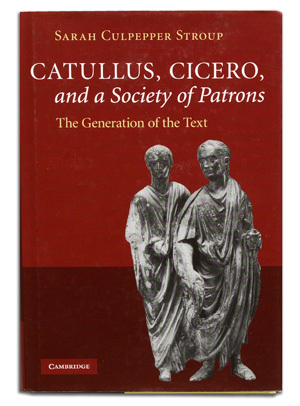 In her book, Catullus, Cicero, and a Society of Patrons: The Generation of the Text, Professor Sarah Culpepper Stroup shows how the two writers’ common interest in both the culture of text and the dedication of text laid the foundation for a textual society. Implied in the Roman patronage relationship was an expected reciprocal bond and mutual obligation. The social meaning of gift giving has been acknowledged throughout human history. In modern society, while there may indeed be a putative expectation of a return gift or favor, a gift is generally considered purely a gesture of friendship or a tribute to love, which can help define and strengthen relationships. Some of the artists’ works paired with Professor Stroup’s book include stories or poetry about love; others were created as paeans to beauty and have been, or could be, given as gifts. As beautiful aesthetic objects in themselves, these books fulfill the dual definitions of text as the content of a book and as the book as an object in itself. In Nelson and Emma: Aphrodite & Ares Contemplate Admiral Nelson & Lady Hamilton, a sumptuous and many-layered book, Charles Hobson intertwines the story of two turbulent love affairs, one historical, the other from Greek myth. Admiral Nelson, best known for his defeat of Napoleon, embarked upon a torrid affair with the married Lady Emma Hamilton, the muse of artist George Romney. Similarly, the married Aphrodite, goddess of love and beauty, had a long and passionate liaison with Ares, the Greek god of war. Hobson adds another dimension to these narratives by introducing connections between love and war in the affairs of both gods and mortals.